Steve Jackson has reviewed PV Productions #13 module and offered to share his findings with us here at the Great Ball Pit. Thanks to Steve for the write-up, and now onto the review. PV-Productions instruction set GBC 13, created by Philip Verbeek, builds a huge Great Ball Contraption that runs either as a solo setup or as a module in a loop. I am enjoying this set! Laid out in a straight line, it’s a whopping 51” long. Some “bend” is possible between each of the six sections, making it very flexible, but the structure is stable. These instructions are a “remix” of Lego Set 42042, the Crawler Crane – that is, it uses only the parts available in that set. Part of the fun for me was seeing the different ways that the designer worked around this limitation. He also used most of the 42042 parts; the web page claims “90%”. It’s probably closer to 85% when you take out the parts used only for decor, but I was not disappointed in my purchase. Mechanically, it’s a simple operation: a conveyor belt takes the balls to a small intermediate hopper, a second belt picks them up and takes them higher, and then a four-section track rolls them down again. It makes good use of the special parts that come with the crane. How compatible is this set with GBC standards? Overall passing grade! • The standard is one ball per second. Built to instructions, PV-13 delivered a ball only about every 3.5 seconds with new batteries or 9V power. By tripling the number of belt pins and adding one link to the upper belt I got this up to 3 balls every 3.5 seconds, which is close enough to 1 for me. • The standard calls for input at 10 bricks height. PV-13 accepts balls at a height of 9+ bricks. • The standard suggests output at about 11 bricks height. The PV-13 output is flexible and easily settles on a delivery at 11 or 12 height. • The standard calls for the input hopper to be 10 x 10 studs x 10 bricks and accept up to 30 balls at once. 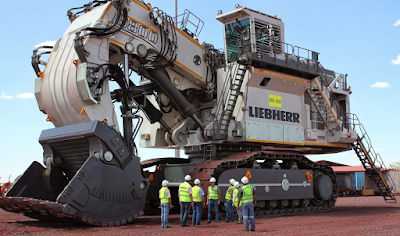 This hopper is only about half that volume – but few modules meet the hopper standard, and it’s easy to place this one after a module that delivers one to four balls at a time, which it easily handles. It took me about seven hours, all told, to put it together. Much of this was steady building, but there were occasional interruptions of a quarter-hour or so while I tried to puzzle out “blue pin in blue part on blue background, printed on a home printer” types of issue. PV-P calls this 177-page instruction PDF an “easy” set. If this is easy, I would have trouble with a “medium.” As it was, there were several instructions that I could follow only by disassembling parts of previous steps, and two “points of no return” where, once I got a part into place, I had to hope it was right because it would never have come out again without the use of explosives. Yet I prevailed. Built according to instructions, PV-13 worked as well as most modules. There were three issues that I thought required some tweaking. • First, as mentioned above, it delivered too few balls. This was trivially solved by adding a lot more standard pins to the belt. More, in fact, than 42042 supplies, but you have a big bag of pins lying around, right? • Second, the belts are under enough tension that the L motor labours and the upper belt moves only in jerks. I might try an XL at some point; the immediate solution was to go outside the 42042 parts pack and add one link to the upper belt. • Third, when the upper belt is set at a steep horizontal angle to the lower one, balls may jump out of the intermediate hopper. Without adding parts, I modified the build slightly to restrict the motion of incoming balls; see closeup in video. None of these is outside the expected range of issues for any GBC build. I had fun and am glad I bought it. I’ll look with interest to see what else PV-Productions creates. The PV-13 instructions are available from www.pv-productions.com. The brick set, 42042, is out of print but still reasonable on BrickLink, and if you’re going to build the module to run, you might as well buy a used set. 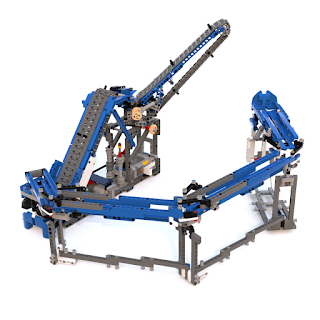 You can play with the crane before tearing it down to build the module.